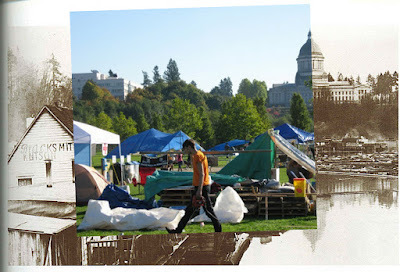 Since Occupy Olympia moved down to Heritage Park, I've been reminded about how fitting the location is for them. Before Capitol Lake, that particular place was home to Little Hollywood, Olympia's depression era shacktown. It was probably the most visible evidence of the Great Depression in town. In March of 1933 several demonstrators from Seattle organized a march in which they demanded food relief for the unemployed. Once the marchers reached East bay Drive they were met by the police and vigilantes calling themselves the American vigilantes. Both the vigilantes and the police surrounded the marchers pushing them back to Priest Point Park. Once the marchers were in the park their attackers used broom handles to beat the marchers into ending their march. The attacker’s actions made sure the second march never reached the Capitol Building. All though the second march failed to generate legal changes the march altered the way history is told. Little Hollywood and the Hunger Marches of 1933 are two important aspects of Olympia’s past that is commonly misrepresented. The Thurston County website claims that the Hunger March of 1933 was a protest of 5,000 out-of-work men who threatened to take over the Capitol building and according to the Daily Olympian “terrorize the town.” Sheriff Havens and his Deputies meet the unruly group with a cadre of deputized citizens. There is no mention of the corralling of the marchers nor is there any evidence that the protestors aimed to be violent. This is the accepted history of Thurston County, not the accepted history of many historians. The importance of Olympia’s past is not being represented and we must not let those who suffered be forgotten. As a lifelong resident my call to action is clear. I must not only tell Olympia’s past but I must urge others in supporting a historical revolution. 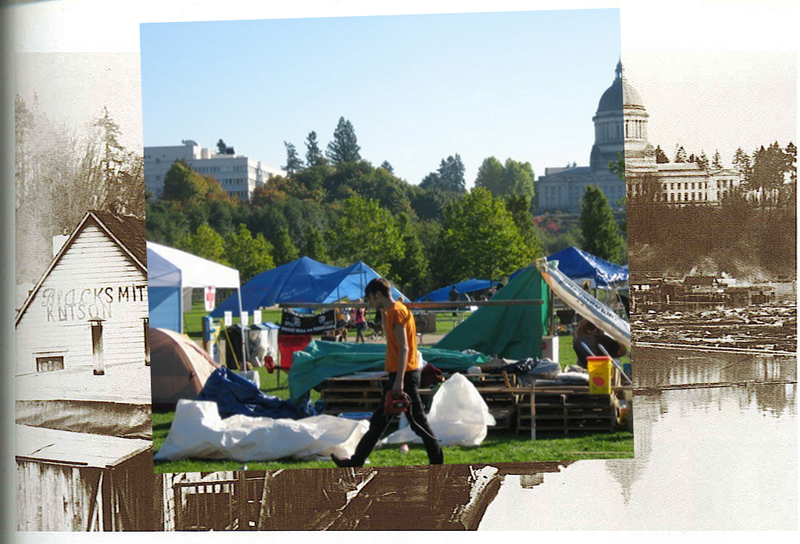 Let's not forget Camp Quixote in the proud history of Olympia protest encampments! Wow, that is a cool picture. As with any event in history, it is interesting to look at both main sides of the event. Especially with an event like this, it is seemingly impossible to know what is fact and what is fiction.